Google made its intentions crystal clear with the release of KitKat. The intention to affect maximum lives became more evident with the release of Moto G, a low end smartphone with killing configurations and yes of course with guaranteed updates. The exceptional phone is now available to be pre-ordered at its official site for customers in US starting at just $179 for 8GB model. Moto G will start shipping from December 2nd. Right now the device is unlocked and contract free however expectations are the by the end of this year it will start selling through carriers too. The phone was first launched on November 13th and was available for few countries in Europe and Brazil. Though the cost of the phone in Brazil is around $280 because of high electronic duties. The configurations at this price is certainly breathtaking. The phone is powered with 1.2GHz quad core Snapdragon 400 processor which is supported by 1GB of RAM. A 4.5 inch 720p display is one of the sharpest HD display available in this range. For taking pictures a camera (obviously) of 5 megapixel is also equipped. 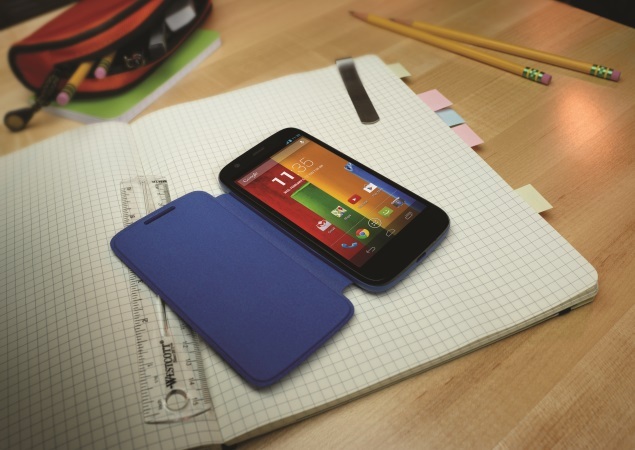 Moto G runs Android 4.3 but Motorola guarantees the next update to available by January next year. Unlike the Moto X, its entire exterior is not customizable. Instead the company offers number of back pops off to switch among. The catch here is Moto G doesn’t support LTE. Instead it is compatible with GSM networks with 21 Mbps HSPA+. The official confirmation has already been made regarding its availability in India which is by early next year. Guy Kawasaki confirmed in a tweet about the Dual SIM version of Moto G in India and Brazil recently. We are expecting that the smartphone will be priced under 15K range.